Autumn. The best of all the seasons, even if it’s only brief here in Minnesota. Yes, Spring is a close second, but when Autumn rolls around, I’m really, truly happy. I love the brilliantly colored, crisp, maple leaves that my daughter brings me as bouquets for our dining room. We live in an old Victorian with dark wood and decor in our living and dining rooms. I always think about re-painting to brighten things up, but when Fall rolls around, it feels so comfortably warm and cozy, and I’m thankful I haven’t changed a thing. 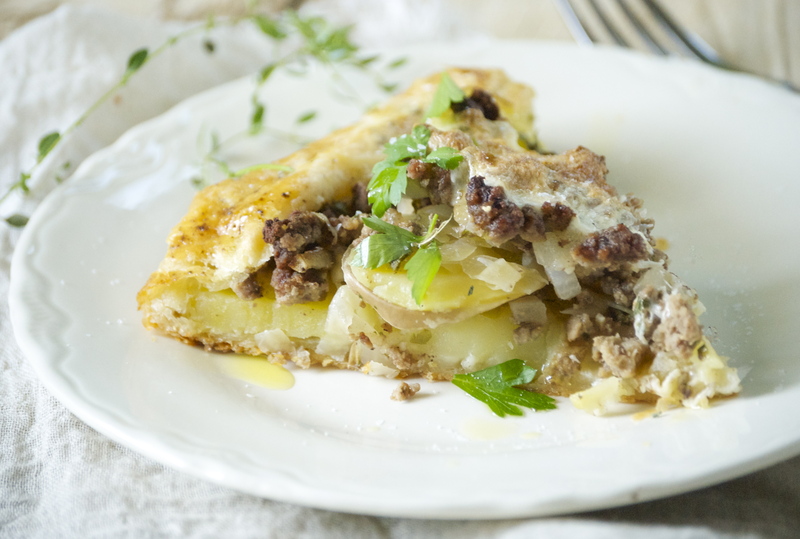 On of my favorite Fall (and even winter, for that matter) dishes is this amazing Rustic Potato, Sauerkraut, and Beef Galette. The combination of beef and sauerkraut is incredible. It’s also a bit nostalgic for me. I grew up with huge pots of meatballs that had been simmering in tangy sauerkraut for hours. Wonderful stuff. 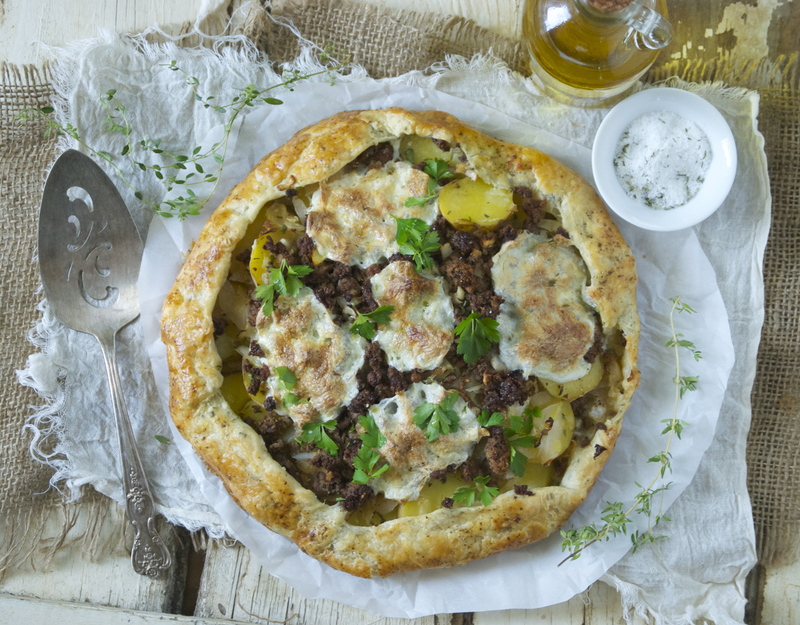 This galette showcases those flavors. Just like my other galettes, the crust is crisp and light. The potatoes add substance, while the fresh mozzarella ensures that the dish is moist enough. Of course, you can substitute another mild cheese, like grated regular mozzarella, if you like. I really wanted the tang from the sauerkraut to be showcased here, rather that hidden underneath a more assertive cheese. I’m planning to share with you all a quick sauerkraut recipe and technique very soon. 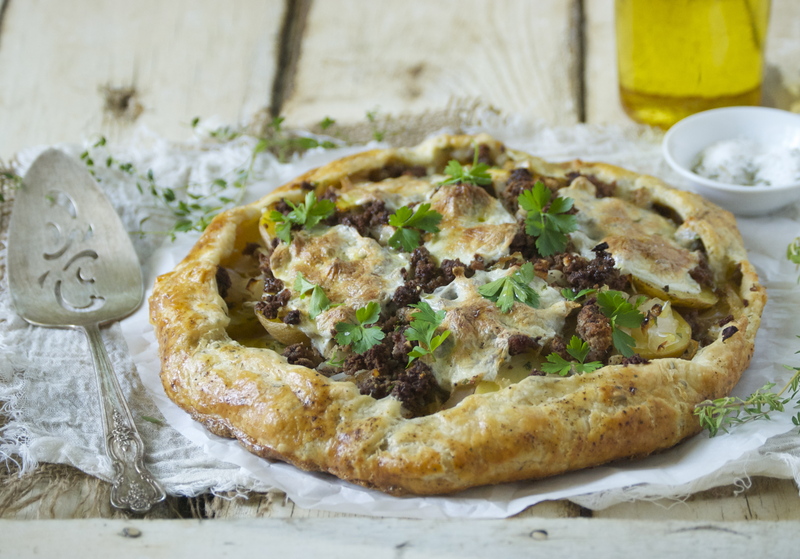 I really hope you give this galette a try– I think you’ll really enjoy it! Follow these directions to make the pie dough. You will only be using one of the dough balls for this recipe. Freeze the other one for another time. Add the fresh herbs when you are mixing the dough. Refrigerate for 2 hours. Proceed. In a large skillet, brown the ground beef over medium/high heat. Drain and discard the grease. To the skillet of ground beef add the chopped onions, garlic, 1/2 teaspoon kosher salt, and a bit of black pepper (you may want to add a glug or two of olive oil, if the pan seems a little dry). Sauté for a couple of minutes until the onions are tender. Remove from heat and set aside. On a lightly floured piece of parchment paper, roll the pie dough out to a 12-inch circle using a lightly floured rolling pin. 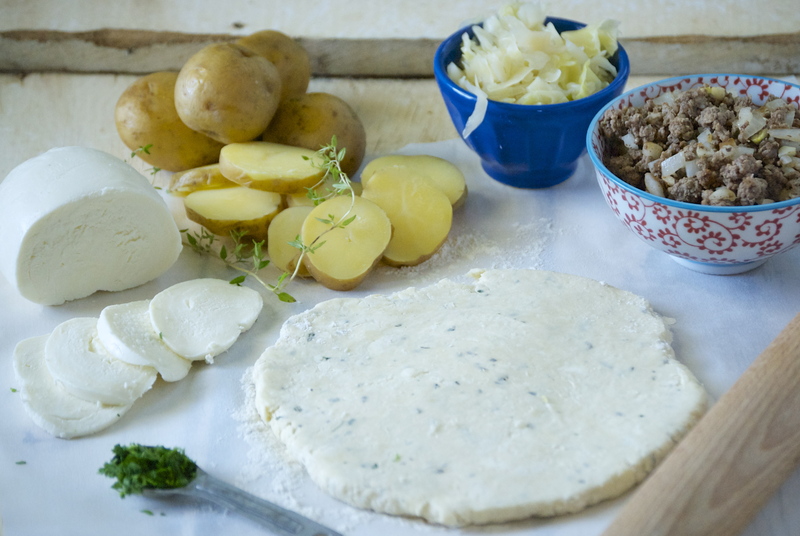 Place the sliced potatoes on the dough, leaving about 1 1/2-inch space around the edge. Sprinkle salt and pepper on the potatoes. Next, put the sauerkraut on top, followed by the chopped parsley. 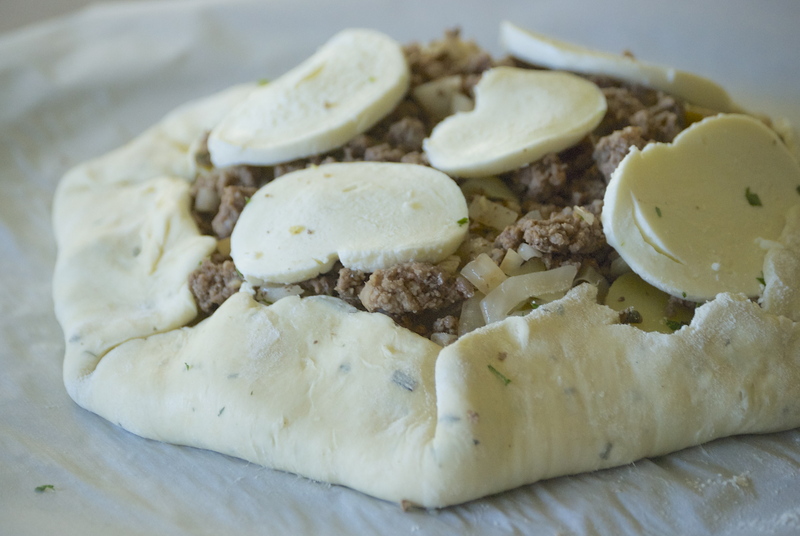 Then add the ground beef mixture, and finally place the fresh mozzarella on the very top. Fold the edges of the dough up and pinch together to seal the seams as much as possible. Use a pastry brush to apply the egg wash to the edge of the dough. Sprinkle salt and pepper on the egg wash.
Slide the parchment paper with the galette onto a baking sheet and bake for 43-45 minutes or until the crust is a deep golden brown. (Keep in mind that every oven is a bit different. If you don’t already have an oven thermometer, I highly recommend you get one. Cheap ones are about $7 and work great. My oven runs 15 degrees hot.) 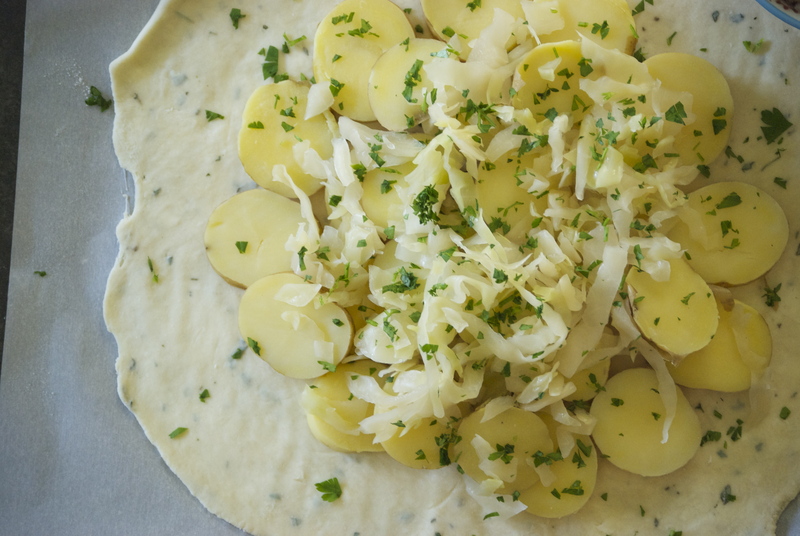 Top the galette with chopped parsley and a drizzle of olive oil before serving. Enjoy! I have to try this one! It sounds great! That’s why I’m here 🙂 Thanks for stopping by. I hardly ever think to make a savoury galette – this sounds wonderful though, such great depth of flavours. Thank you for the inspiration! I just love savory galettes, Kathryn! The possibilities are endless. This looks fabulous! I love meals like this- right up my alley. Thanks, Rachael! Right up my alley, too. It was so great to meet you yesterday. Hope to be running into you more often (whenever you’re visiting, that is)! Hi Marilyn– I’m honored that I’m the first blog you’ve commented on. There is a link to my dough right below where the recipe begins– it’ll appear in a different color than the rest of the text. Just click on it and it’ll send you to the right spot. It’s a great dough recipe. I love this galette so much. Let me know if you happen to make it. Thanks!